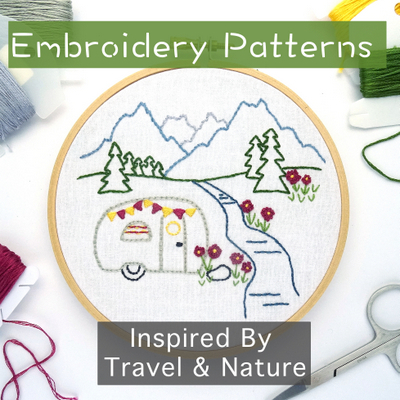 I was talking with my mom on the phone a few days ago while she read our latest blog post. “There aren’t any pictures of Phin”? she asked with a somewhat disappointed tone. “Um, no not this time.” You’ll notice she didn’t even mention that the post did contain a rare picture of both Tim and I. Something that doesn’t happen all that often. And I only included it out of guilt because it had been so long since our last joint appearance on the blog. 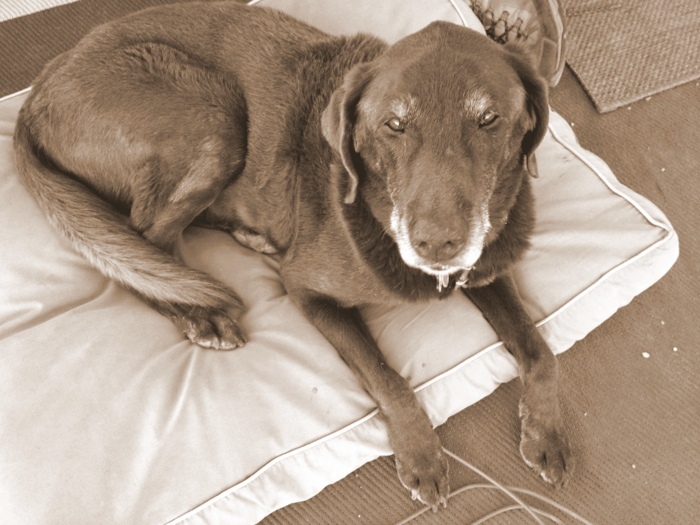 That wasn’t good enough though because apparently she only wants to see pictures of her grand-dog. Kidding- I know she likes us too, but I also know Phineas is pretty cute, and oh so photogenic. So here you go. 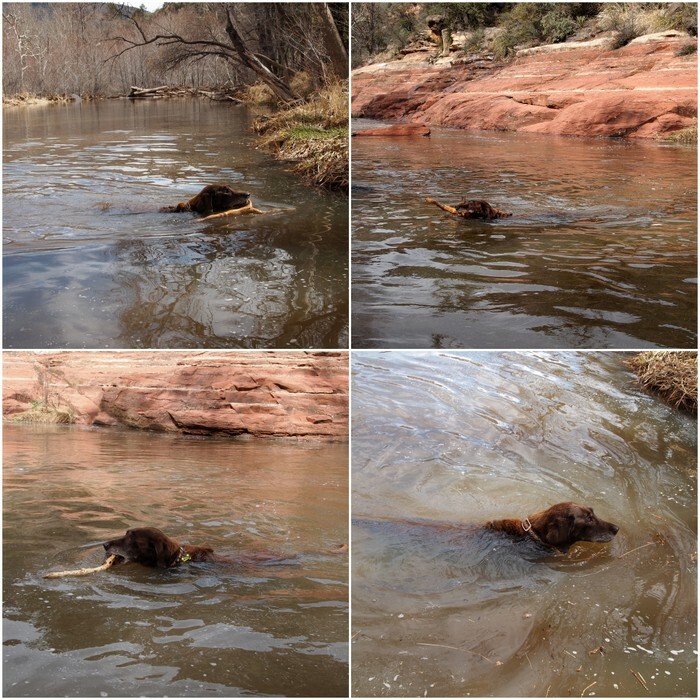 To make up for the lack of canine cuteness in the last post here is a whole bunch of Phineas pictures (and a few of our last hike in Sedona thrown in at the end). Phineas lovers rejoice. The reason Phineas wasn’t in the last post is because it was all about hiking, and these days he doesn’t do much hiking with us. Most of our hikes are just too long for him. Also out here there’s a lot of rock scrambling, which his old legs can’t handle the way they used to. Don’t worry though- he’s still gets to have his fun. 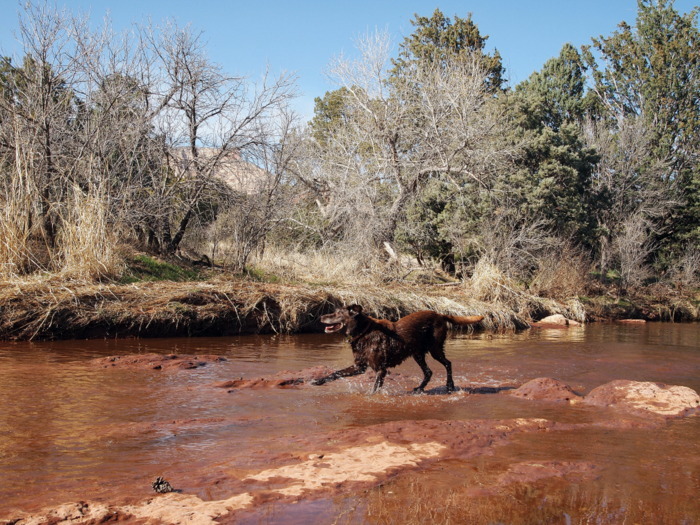 There’s been lots of ball chasing around the airstream, some short walks along what appears to be an old cow path near our camp, a small hike to find a geocache, and of course, lots of time in the water. This dog is all about water. 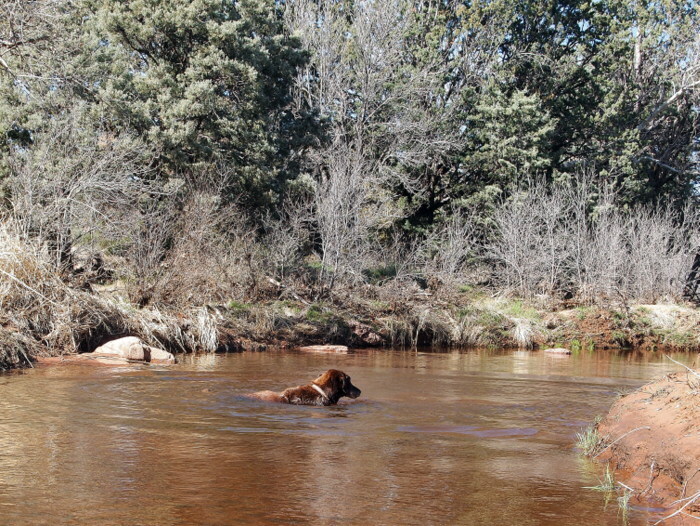 Lucky for him there was a creek only minutes down the road from our camp. Found some! Just enough to get the body wet. 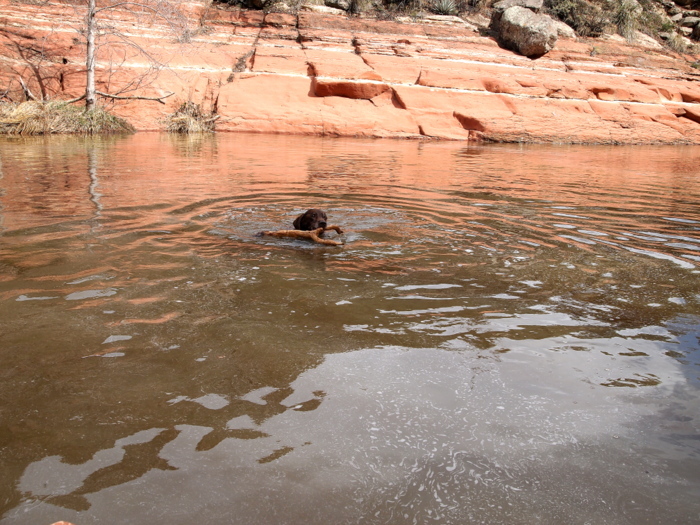 Lucky dog also got to go on a trip north of town in search of a deeper swimming hole along the banks Oak Creek. 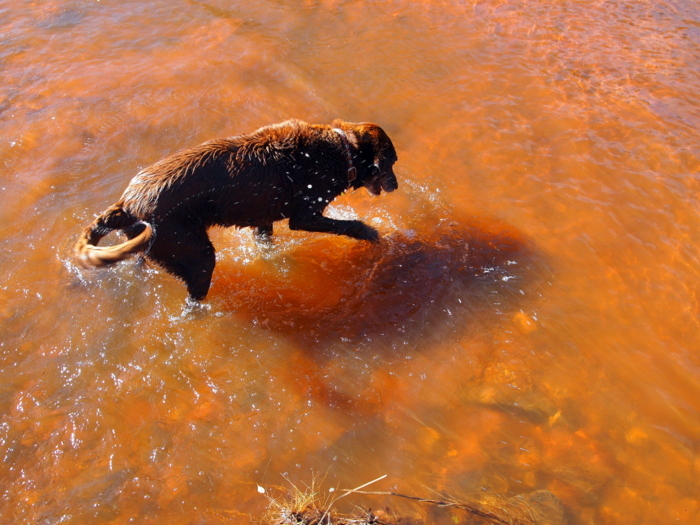 Yum- gotta love that fresh river water! 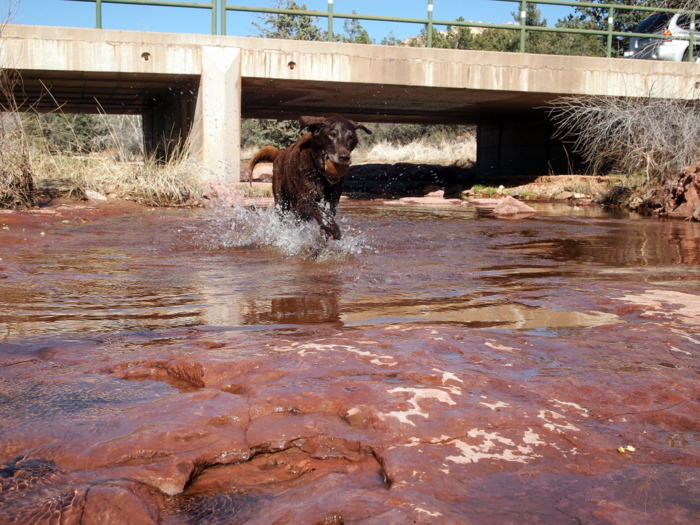 After the recent snowfall followed by warm temperatures the river was running pretty fast. We walked downstream a bit and found a spot near a beaver dam where the current was much calmer and Phin wasted no time hoping in for a swim. The water was pretty cold and after about 10 minutes the poor guy was shivering up a storm. He didn’t care though, he still wanted more. Eventually we managed to drag him away and dry him off. Let me tell you he was one happy dog for the rest of the day. 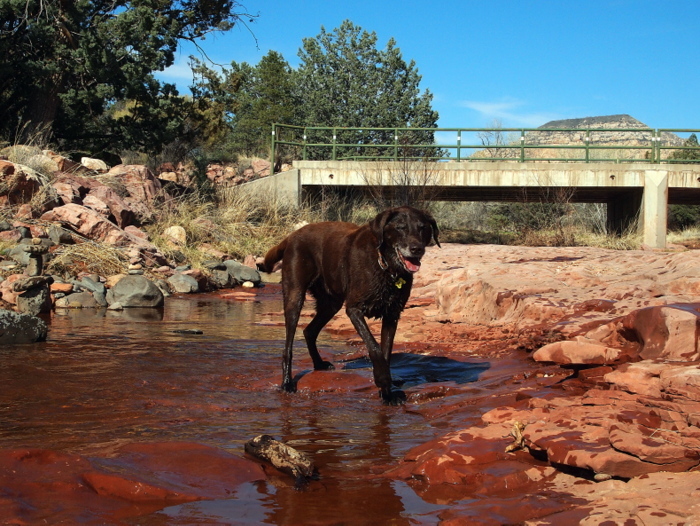 In between trips to the creek with our crazy water loving pooch, we managed to get in one more hike among the red rocks of Sedona. 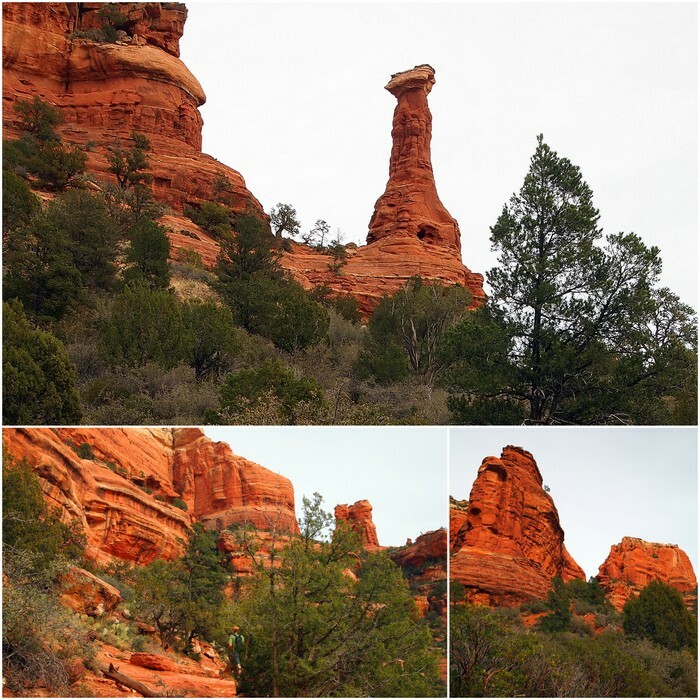 Boynton Canyon is a popular moderate hike that clocks in around 7 miles round trip. 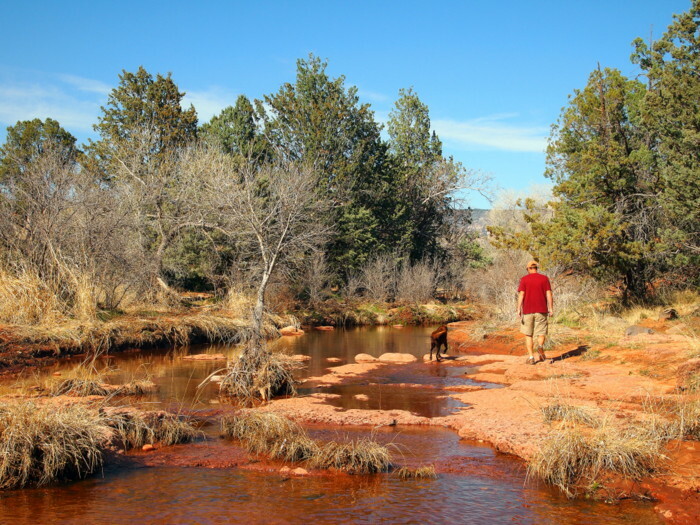 The first few miles traverse between tall red rock formations and a fancy schmancy resort area with nice houses, a golf course and a scary sign warning us dirty hikers to stay away. The trail continued farther into the canyon and we hiked for a few miles among some tall pine trees. Finally we reached the end of the canyon and followed the trail a few hundred feet up a steep grade to a lookout spot. 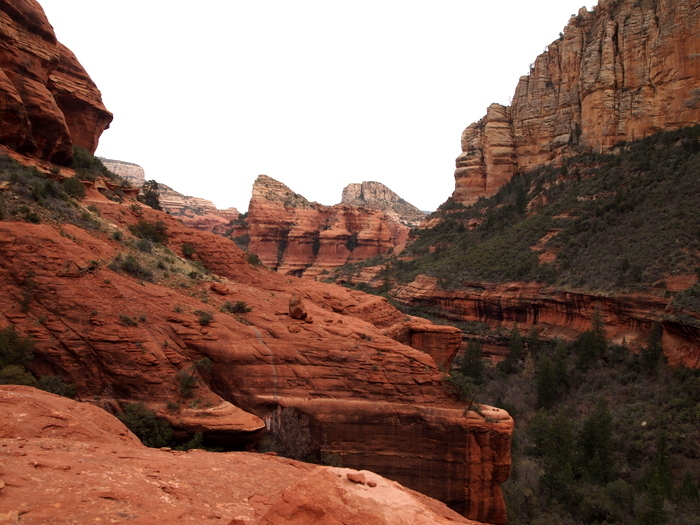 It made for the perfect last hike in Sedona with plenty of red rocks and a stellar view at the end. 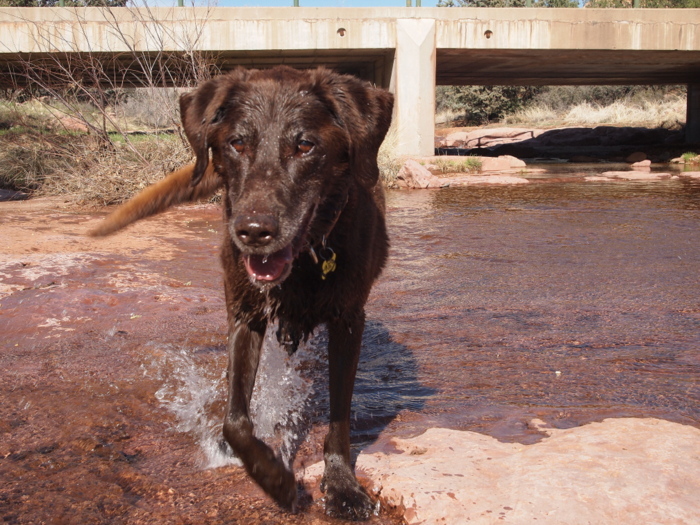 Sadly our time in Sedona has come to an end, but we look forward to a return visit someday with many more hikes and trips to the river. For now we will move north into Utah where we plan to spend the rest of March and all of April. We have some great spots scoped out and even made reservations at a state park with a lake. So get ready for many more Phin + water pictures coming your way. I’m with your mom. I like the dog pictures. It is so much easier to just enjoy everyone else’s dogs than get one ourselves! I am glad you said Phin was getting cold at the end. I was thinking that exact thing especially in the deeper water. Boy, you could really tell he was having fun. Thanks for taking me back to beautiful Sedona. What an amazing place! Your photos were so vivid. Enjoy Zion! The shuttle starts tomorrow and boy do they need it. There is so little parking and way too many people right now. 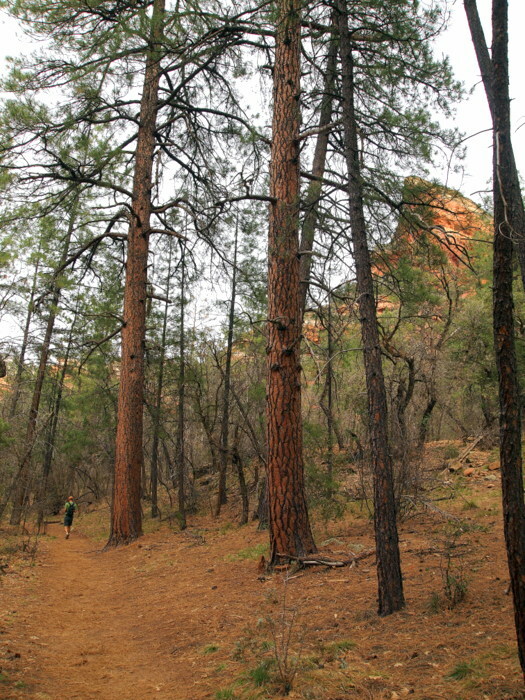 We have a few hikes left in the East Canyon to do tomorrow. Then, we are going to check out a trail in Santa Clara and then a park near Leeds. We will be here outside Zion until a week from tomorrow. Maybe we can cross paths. We’re planning to head over to the first-come-first serve South Campground in Zion on Tuesday morning in hopes of getting a spot. If it’s full than there’s a private park nearby that we’ll stay at. In any case we will be in the area very soon and maybe we can meet up somewhere. 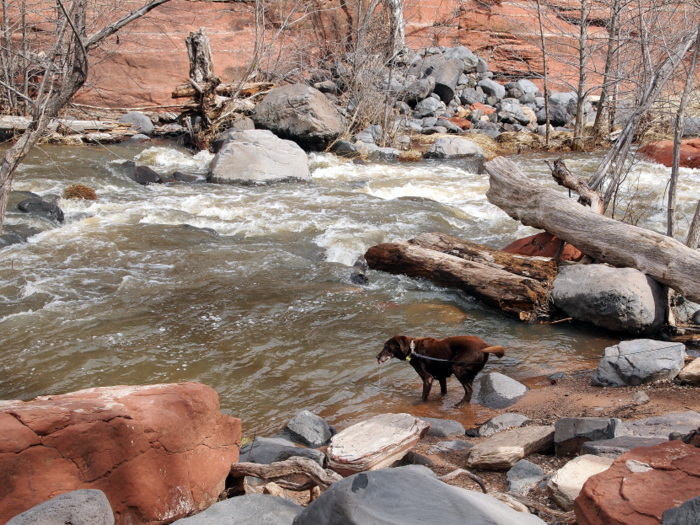 Loved the photos of your dog and those of Boynton Canyon. Great hiking out there, isn’t it? 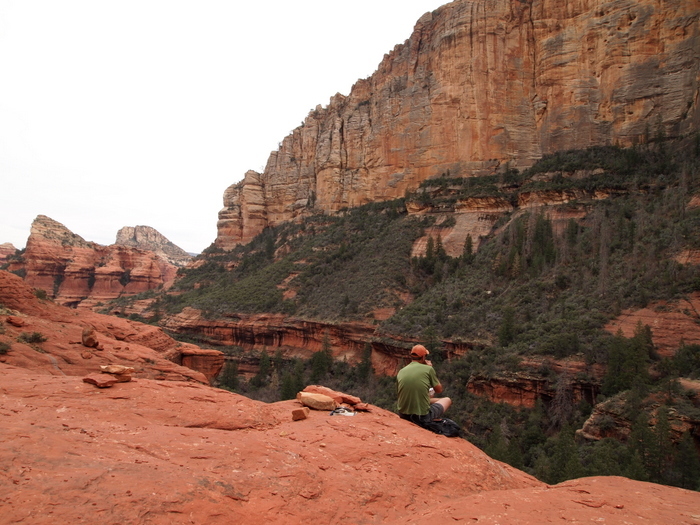 Sedona has some of the best hiking we’ve found in the southwest. So glad we changed our plans to include it as a destination.